St Lucia KwaZulu Natal, once again a beehive of activity. This quaint little town once again is full to the brim as tourists flock to witness some amazing and magnificent sights in and around St Lucia. St Lucia KwaZulu Natal, was primarily known as a fishing destination, however since it's world heritage status in 1999 the area has grown in leeps and bounds. World Heritage Status has fortunately not changed the town much, due to the fact that the entire area is surrounded by a green belt and water. The Indian Ocean to the West, the Estuary to the East and then the remainder is greenbelt. This has ensured that the Town has remained relative in size. Numerous new accommodation establishments have opened on previously vacant land adding to economic stability in and around the area. So what's all the hipe about then surely it's just another town. It's a small town with approximately 550 permanent residents. All of which are involved directly or indirectly in the Tourism sector, and of course theirs the Hippos that are the main attraction all working together in a unison to promote this fantastic place of wonder. The 800 or so Hippos and residents have a certain respect for one another. 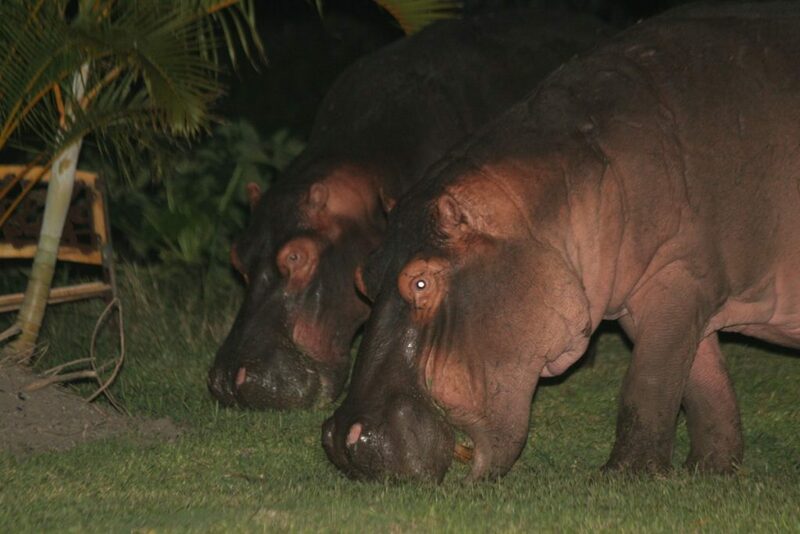 Numerous home owners have deliberately not fenced their properties purely for the fact that the Hippos graze on the grass in the evenings. This sighting remains wonderful watching as they travel quietly through the streets at night. However it's not just Hippos that one may enjoy seeing, just imagine seeing Bush Babies in the trees with their somewhat eerie cries, Bush Buck, Duiker, Kudu and yes sometimes even Leopard. The area is subtropical, near perfect year round however quite warm during summer (February) being the warmest. The Indian Ocean offers the perfect setting for lazying about, fishing, snorkeling and exploring its pristine beaches as far as the eye can see. St Lucia, KwaZulu Natal deserves world heritage status, its a quite place and definitely the place to be should you love wildlife. Nowhere else in South Africa can one enjoy such variety from its Estuary, Beaches and Wildlife. Not enough well hopefully not, 3 km from town one will enter the iSimangaliso Wetland Park journey towards Cape Vidal and be immersed by the abundance of wildlife. This is a Big 3 to 4 Park. Odd as that may sound the Elephants cross the Estuary every so often from the Western Shores. With numerous hides and off roads to enjoy while en-route to Cape Vidal be on the look out for the second highest vegetated sand dunes in the world. This is also one of the first national parks to start De Horning Rhino's due to the unfortunate poaching that has gripped the country for some time know. Along the coast during Summer one may encounter numerous Turtle nests as they come ashore to lay their eggs, this super occurrence takes place every year from November to end February. Then as we enter winter the mighty Humpback Whales return and its one of those incredible scenes to enjoy from the beach as they breach. Cape Vidal offers numerous picnic areas, protected bay for some amazing snorkeling and swimming. Please make sure that should you snorkel in the bay that you do so in the designated areas only as well as only during the low tide please. Within the park (Eastern Shores) be on the look out for Black and White Rhino, Buffalo, Leopard and of course the Elephants that occasionally visit. Let's not forget about the smaller wildlife Kudu, Water Buck, Impala, Duiker, Warthogs, Hyena and much more I assure you. Visiting the Western Shores, (opposite of the Estuary) offers the Big 4, yes the Elephants are here more often than on the Eastern Shores. The Western Shores has a different feel to it than its counterpart. It feels more bushy large open grasslands, woodlands and more. Numerous upgrades to the park has seen an influx in tourists and I can truly say its a very nice destination. Still not enough well then how about the oldest proclaimed game reserve in Africa (Hluhluwe-Imfolozi Park) a mere 40 minutes drive from St Lucia KwaZulu Natal. This is a Big 5 Park with some magical history and of course tremendous wildlife. If you should travel from St Lucia then the Imfolozi Gate would be the closest. Its a large park 96000 hectares in size, phenomenal wildlife, hides and picnic areas. So should you have had enough sun and beach time then jump into your car or join a organised safari departing from St Lucia. From St Lucia, KwaZulu Natal one can also enjoy numerous other destinations that are close enough for a day outing, Emdoneni Cheetah Interaction, Bayete Elephant Interaction and Zulu cultural Tours ( Veyane Village). Enjoy St Lucia its a lovely place.